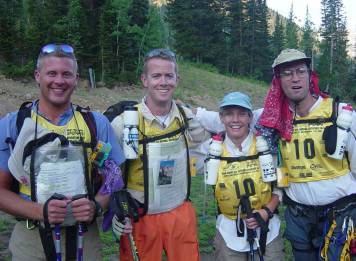 Day 1 - We make it to the starting line with backpacks bursting at the seams with gear and feeling like we�ve just shown up for the Tour de France on a Schwinn Stingray with a banana seat. How come we seem to have so much stuff and others have so little? All we have is the mandatory stuff�it�s too late to worry now. The countdown begins and the teams are off! The race starts with a strenuous climb of the Peruvian Gulch trail, an incline that gains 3500 feet in a mile and a quarter reaching 11,000 feet. We choose a strategy of conserving energy on this tough opening section of the course and to let the others burn up as we pass the remains along the way. Huffing and puffing our way to the top near the back of the pack we are rewarded with incredible alpine views that others are likely going too fast to enjoy. Topping out on Hidden Peak, we traverse a knife-edge ridge, a jumbled mass of sharp broken rocks with over 500 feet of exposure on either side. Picking our way through the ridge and gazing at the surrounding terrain is why we�ve come here. This makes it worth the stress of preparation. 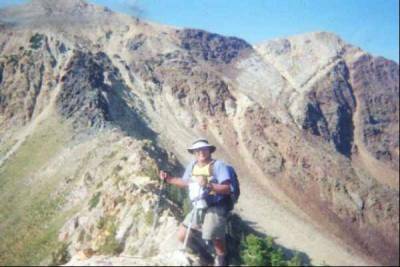 On top of the second summit of the day at 11,700 feet, we�ve reached CP 1. At CP 2, we are presented with our first route finding challenge. We can follow a two-track road down to the bikes. It�s simple, but indirect due to many switchbacks on the mountain. Choice B involves reversing our course about � mile and running 3000� down a scree field and following a river to the bikes. It looks good on the map, but we could encounter terrain too steep to handle and may run into some tough bushwhacking. We could also be rewarded with a quick trip to the bikes, but we decide that we�re not ready to take chances as a new team and that we will play it safe with option A. The alpine section is followed by a long bike ride through the mountains. We�re excited about the opportunity to get off our feet and make some progress on the bikes. That is, until we see the trail. It�s an uphill singletrack trail that only a horse could love. The next 9 hours will have us pushing our bikes through the mountains instead of riding them. We arrive at the Timpanookee Campground checkpoint at midnight and as we rest for a few minutes, we listen to the sounds of a bear growling nearby. After a long day and night, we finally arrive at Transition Area 1, Utah Lake Campground, at 4:50 AM to find our crew, Jerry and Randy Bauer, ready for us. We decide to catch a couple of hours sleep and hit the water at daybreak.